Facebook’s happiness measurements have been little more than novelties so far. But the analytics team has just tweaked its system to cover more of the world, and turned the happiness index into a serious research tool. The first results are in: sports and national events can make us all sad, it seems. Facebook‘s off-topic investigation of happiness has in the past been tightly limited to just a few nations. Now the team’s used the localization powers of Facebook to add in 18 more nations, including places like India and Spain, to create a much more international index. The trick here was to use huge numbers of anonymized status updates from each nation to ensure statistical significance, and to use only those languages for which the Facebook has a reliable dictionary-translation system so that cross-comparisons between nations are meaningful. And what did the Happiness Analysis find? That everybody, around the world, loves holidays. Yet each nation’s particular cultural mix and religious leanings comes into play. 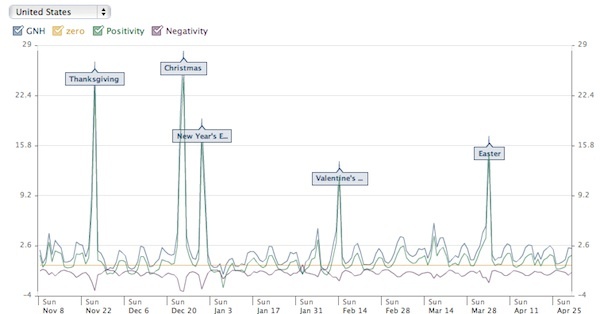 While Christmas and Easter cause big spikes in happy status updates in the U.S. and Spain, the Indian Holi day in March is significantly happy as is the country’s Independence day in August. 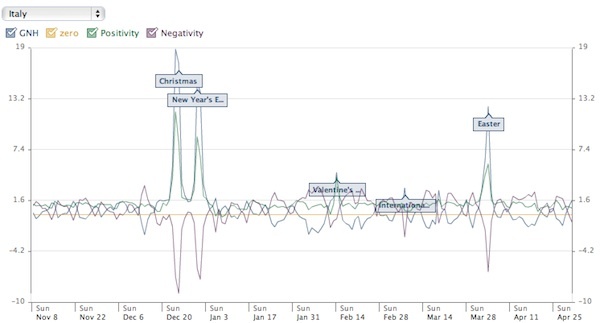 Italy shows a more significant dip in negative statements associated with holiday days than the U.S. does…which may be a measure of the generally passionate Italian world view–demonstrating that Facebook’s data may even reveal national emotional habits. Disasters also play into the stats, and Facebook’s team highlights a low in Chile’s happiness index in February correlating with the disastrous earthquake there. November 2008’s data for India shows a happiness dip that corresponds with the terrorist attacks in Mumbai. These results are not surprising, but they validate the rest of Facebook’s results, which are often less intuitive. Sports events can cause huge dips in happiness too, it turns out. Ireland’s happiness data took a knock on November 18, 2009 when a controversial refereeing decision had Ireland losing out to France in the World Cup playoffs. Facebook’s also taken positive and negative phrases and tallied up a Gross National Happiness graph for different nations over time. This data is intriguing, and could be used as an indicator of the end of the economic recession. The U.S., for example, is seeing a decrease in negative statements, and a boost in positive ones compared to September 2008. In India there’s a big dip in negative statements, but no corresponding boost in positive statements. Colombia demonstrates a very unhappy nation, with big rises in negativity and an overall dip in GNH. The reasons behind each of these nation’s trends will be complex, and individual (in India, perhaps, the cultural trends aren’t leading to public confidence at the moment) and will need thorough analysis to work out what’s going on. And that’s actually the power of the happiness index: It’s got tremendous potential for scientific and social analysis by academics the world over. Granted, Facebook only reflects the mood of an internet-connected, and generally well-heeled segment of any country’s population. But someday historians may be able to examine this sort of data and discover unseen trends with the benefit of future hindsight. And here’s a thought: If you were a high-ranking politician, wouldn’t you be intrigued to find out what Facebook’s statistics show your nation is feeling on a week by week basis? It may be the sort of data that becomes even more reliable than public opinion polls.